GitHub is pleased to announce that version 1.0 of the Atom text editor is now available fromatom.io. Read the full behind the scenes story over on the Atom blog. Organizations have always been the best way for teams to work together and collaborate on code. 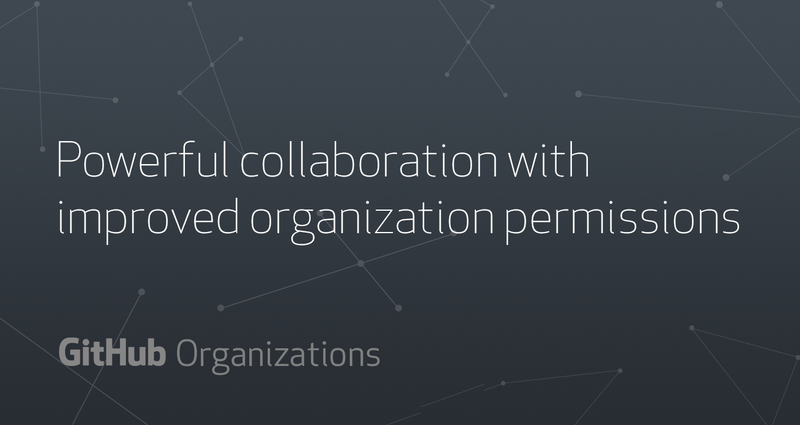 We're happy to announce major improvements to GitHub organization permissions. These improvements include new customizable member privileges, fine-grained team permissions, and more open communication. (Opt-in) Members can view and mention all teams, even when they're not on those teams. (Opt-in) Members can create repositories without help from an owner. Members can create new teams to self-organize with the people they work with. Owners can give just the right amount of access to contractors and interns by adding them to repositories without giving them the privileges of organization members. And many more! 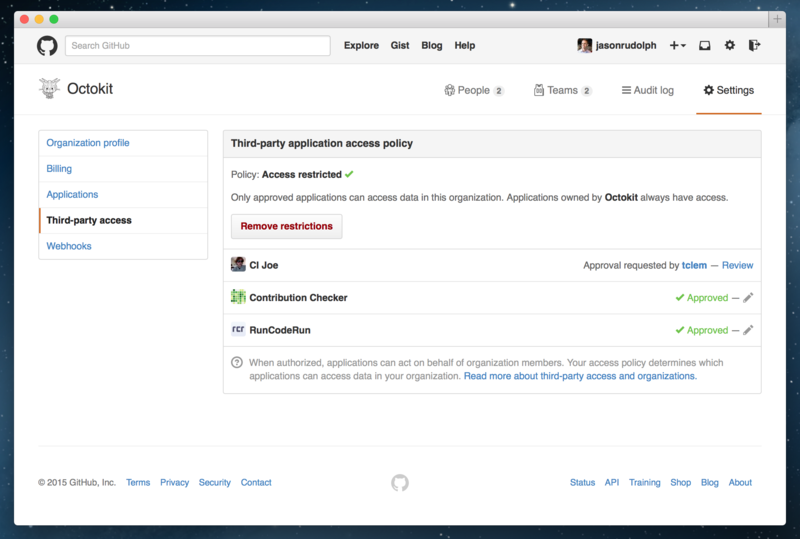 Learn about GitHub's improved organization permissions. All of these new features give your organization the ability to work together seamlessly without everyone needing to be an owner. Once these features launch, organization owners will be able to turn on new permissions as needed. Simply opt-in when you're ready. We're rolling out our improved permissions system to a select group of users who will be asked to provide feedback over a short survey as part of the program. If you're interested in being one of the first to try it out on GitHub.com, sign your organization up for early access. In the next few months, every organization on GitHub.com will have the improved permissions system. This is just a sampling of the amazing line-up. Check out the full preview over at the CodeConf site. Reserve a spot in one of our hands-on workshops led by expert trainers. Space is limited, so register early. Join us the evening before the conference to enjoy the company of the Nashville open source community and grab your badge early. You won't want to miss the food from legendary Hattie B's. Register for a discounted room at the Gaylord Opryland Hotel. Shuttles will depart at convenient intervals so you can easily get to and from the conference. By booking a room at the Opryland instead of a downtown hotel, you save about $100. There are still a few sponsorship opportunities left, including our scholarship program.Check out the prospectus and drop us a line at [email protected]. Find more details about everything we have in store for you on the new codeconf.com. Lastly, we'd like to thank everyone who took the time to send us their ideas. We were overwhelmed by the quality and creativity of the 300+ proposals submitted. You are the heart of CodeConf. Ticket prices go up to $399 on May 25th and we can't wait to see you in Nashville, so what are you waiting for? The Organization audit log allows you to quickly review actions performed by members of your organization on GitHub. You may need to look for specific activity or even through your organization's entire audit log to help aid in legal cases or keep record of suspicious activity. To do just that, you now have the tools to export your organization's audit log in either JSON or CSV format. Distributed version control systems like Git have enabled new and powerful workflows, but they haven't always been practical for versioning large files. We're excited to announce Git Large File Storage (LFS) as an improved way to integrate large binary files such as audio samples, datasets, graphics, and videos into your Git workflow. Git LFS is a new, open source extension that replaces large files with text pointers inside Git, while storing the file contents on a remote server like GitHub.com or GitHub Enterprise. Git LFS is easy to download and configure, works on all major platforms, and is open sourced under the MIT license. We're ready to roll out Git LFS support to a select group of users. If you'd like to be one of the first to try it out on GitHub.com, sign up for early access using your GitHub account. In the next few months, every repository on GitHub.com will support Git LFS by default. Every user and organization on GitHub.com with Git LFS enabled will begin with 1 GB of free file storage and a monthly bandwidth quota of 1 GB. If your workflow requires higher quotas, you can easily purchase more storage and bandwidth for your account. Want to start working with large files on GitHub.com? Sign up for early access. Just like our Mac client, you can now use GitHub for Windows to submit pull requests to GitHub or GitHub Enterprise, right from your desktop. We didn't forget forks, either! If you fork a repository and then want to contribute changes to the upstream repository, GitHub for Windows will keep track of upstream branches. This means less hassle when you're ready to contribute your changes back. Download GitHub for Windows and start sending pull requests now! This means that you can focus solely on what’s most important to you: your changes. This is yet another step toward our grand vision for GitHub for Mac, with plenty more to come, sogive it a shot! If you already have GitHub for Mac installed, it will update itself to the latest version automatically. As always, we’d love to know what you think. If you have any comments, questions or bug reports, please let us know. 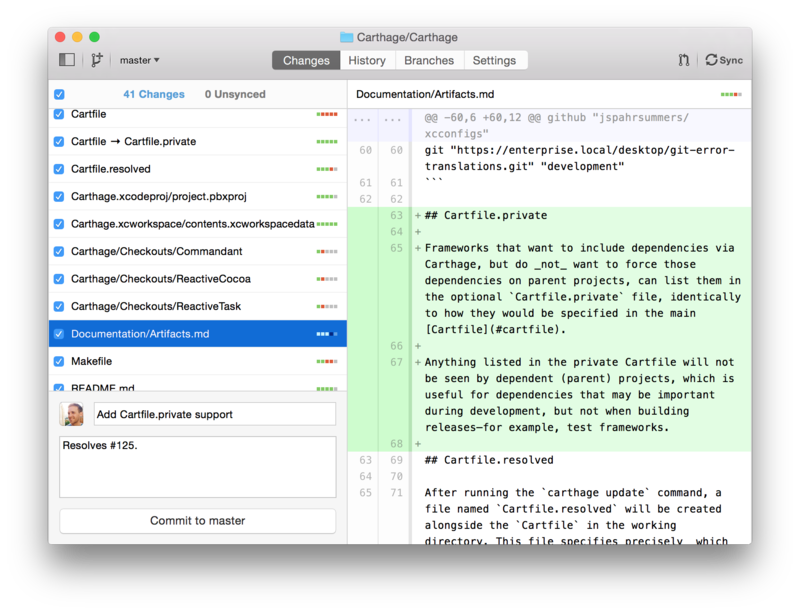 The Git developers have just released a major new version of the Git command-line utility, Git 2.3.0. As usual, this release contains many improvements, performance enhancements, and bug fixes. Full details about what's included can be found in the Git 2.3.0 release notes, but here's a look at what we consider to be the coolest new features in this release. One way to deploy a Git-based web project is to keep a checked-out working copy on your server. When a new version is ready, you log into the server and run git pull to fetch and deploy the new changes. While this technique has some disadvantages (see below), it is very easy to set up and use, especially if your project consists mostly of static content. 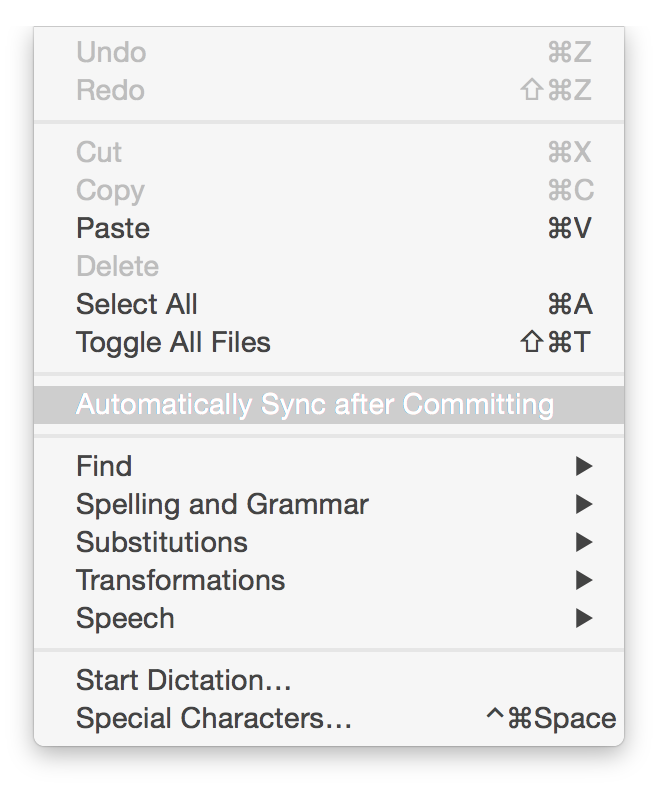 With Git 2.3, this technique has become even more convenient. Now you can push changes directly to the repository on your server. Provided no local modifications have been made on the server, any changes to the server's current branch will be checked out automatically. Instant deploy! When shouldn't you use push-to-deploy? Your server will contain a .git directory containing the entire history of your project. You probably want to make extra sure that it cannot be served to users! During deploys, it will be possible for users momentarily to encounter the site in an inconsistent state, with some files at the old version and others at the new version, or even half-written files. If this is a problem for your project, push-to-deploy is probably not for you. If your project needs a "build" step, then you will have to set that up explicitly, perhaps viagithooks. The new --dissociate option tells Git to copy any objects it can from local repository../oldclone, retrieving the remainder from the remote repository. Afterwards, the two clones remain independent; either one can be deleted without impacting the other (unlike when --reference is used without --dissociate). The new default behavior is meant to help users avoid pushing changes to the wrong branch by accident. In the case above, the experimental branch started out tracking master, but the user probably wanted to push the experimental branch to a new remote branch called experimental. So the correct command would be git push origin experimental. When Git needs a password (e.g., to connect to a remote repository over http), it uses thecredential subsystem to query any helpers (like the OS X Keychain helper), and then finally prompts the user on the terminal. When Git is run from an automated process like a cron job, there is usually no terminal available and Git will skip the prompt. However, if there is a terminal available, Git may hang forever, waiting for the user to type something. Scripts which do not expect user input can now set GIT_TERMINAL_PROMPT=0 in the environment to avoid this behavior. Don't forget: an important Git security vulnerability was fixed last December. If you haven't upgraded your Git client since then, we recommend that you do so as soon as possible. The new release, 2.3.0, includes the security fix, as do the maintenance releases 1.8.5.6, 1.9.5, 2.0.5, and 2.1.4, which were released in December. It's a new year and we couldn't think of a better way to start it off than with a new release of GitHub Enterprise. We've included a number of highly-requested features, along with some of the best stuff recently shipped on GitHub.com - all to give developers and admins the best tools to build and ship software at work. Let's talk about some of the features you'll find in this release. Many of you have told us that you want it to be easier to use GitHub Enterprise with LDAP, especially for organizations managing lots of users. With this release, GitHub Enterprise integrates with your LDAP directory more deeply than ever before, automating identity and access management for your organization. This means you can provision and deprovision user accounts in GitHub Enterprise directly from LDAP with user sync, and automatically grant users access to repositories with team sync. While we were at it, we also improved LDAP performance across the board, increasing reliability and throughput. One of our goals with last year's rebuild of GitHub Enterprise was to make it available in more of the environments where you want to run it, whether you're managing your infrastructure on servers you own or on an internal cloud-based platform. That's why we're excited to announce that with this release, GitHub Enterprise is available on OpenStack KVM, in addition to Amazon Web Services and VMware. If your tech stack is built on KVM, you can now easily set up GitHub Enterprise and integrate with other parts of your internal system. The Organization Audit Log that shipped with the November release of GitHub Enterprise has now been expanded to the instance level, giving administrators a skimmable and searchable record of every action performed across GitHub Enterprise in the past 90 days. Events like repository creation, team deletion, the addition of webhooks, and more are surfaced in a running log, along with information about who performed the action and when it occurred. These events can be filtered for deeper analysis, and you can create a wide range of custom search queries to make sure you're always aware of what's taking place on your instance. Are my users experiencing errors? Are things fast or slow for my users? What is a typical traffic pattern? What is abnormal? 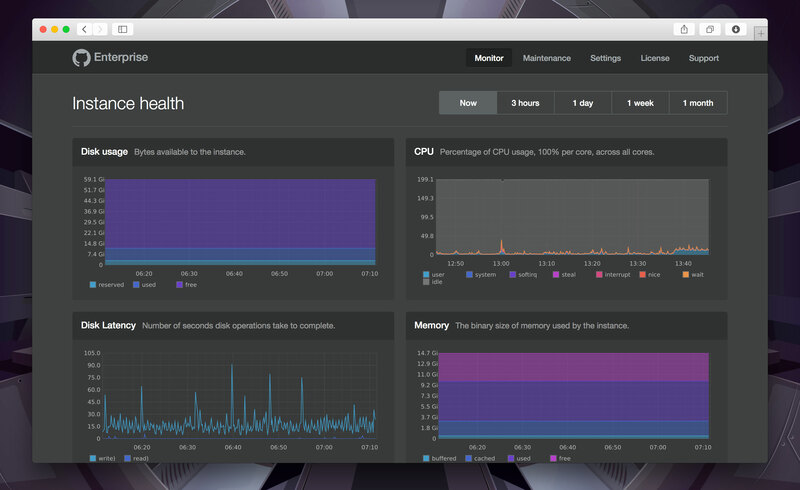 Should I upgrade CPU, memory, or IO to improve the performance of my instance? When should I plan to increase my disk space given my current growth rate? To see the full list of features and bug fixes, check out the release notes for GitHub Enterprise 2.1.0. If you're an existing GitHub Enterprise customer, you can download the latest release from the GitHub Enterprise website. If you want to give GitHub Enterprise a try, start a 45-day free trial on OpenStack KVM, AWS, or VMware. Applications integrate with GitHub to help you and your team build, test, and deploy software. But not all apps are created equal. By adopting a list of approved applications, organization admins can better manage which apps can be given access to their organization's data. If you're administering an organization on GitHub.com, you can set up a whitelist of trusted third-party applications. With this protection in place, all applications need your explicit approval before they can access your organization's resources. You can grant access to your favorite continuous integration service (for example), while ignoring other applications that you may not trust or need. If you're a member of an organization and have a third-party application that you want to use, simply ask your organization's admins to approve access. They can then review the requested application to decide whether it should have access to your organization's data. Pull requests are fantastic. We use them every day to review and discuss code, documentation, and designs. 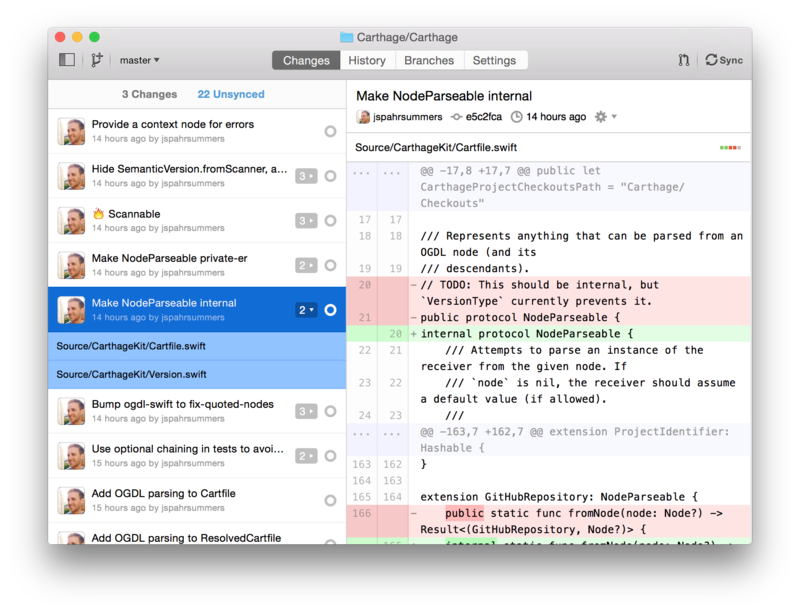 Now you can create pull requests without leaving the warm embrace of GitHub for Mac. We've also made forks easier to work with. Forked repositories now automatically fetch their upstream repository, and its branches can be checked out or merged. No more futzing with the command line or multiple remotes! Download GitHub for Mac and start sending pull requests! Starting conversations around changes is what pull requests and GitHub Flow are all about, so we’re excited to introduce a powerful shortcut that gets you there even faster. Reducing the time it takes to open a pull request lowers the contribution barrier, and having this workflow available entirely within the browser makes collaboration more approachable for people with all technical skill levels. To learn how GitHub Flow works, and whether it might be a good workflow to use on your projects, check out our guide on Understanding GitHub Flow. Unified and split diffs now feature syntax highlighting, which adds colors to your code to make its meaning and structure clearer. Now you can more easily understand the code that was changed in a commit, pull request, or review comment. See it in action at dotnet/corefx or your favorite repository. Since we introduced the Status API, you've been able to improve the quality of your code by including the status of a pull request within the conversation timeline, for every push. Before today, you've only been able to see results from one service. Now you can see all your results at once, from multiple CI systems that test your code against different platforms to simultaneous security testing and code coverage analysis. You can also see how the status of a pull request has changed over its history by clicking the icons listed next to individual commits. If you're interested in how to set up your own statuses, take a look at our Status API docs along with this guide to building your own CI service. You can also check out some the services that use the Status API to help you keep your code clean, confirm your tests are passing, and make sure contributors have agreed to your CLA. 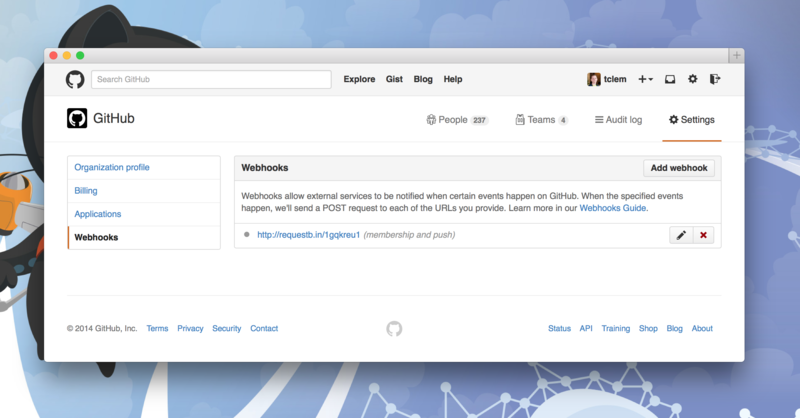 Webhooks are now available at the organization level on GitHub.com. Organization webhooks send events for all repositories in an organization. They also include new events for repository creation, team membership, and more. If you're extending GitHub into your internal systems, organization webhooks save you time by helping you configure integrations across multiple repositories in one place. The addition of organizational-level events, like team membership, open up new possibilties for integrators building applications that work with GitHub. For all the details, check out our updated webhook developer guide.